I beg God about what to write, but when He says, “Just be real and don’t hide what you’re struggling with,” I don’t want to accept His answer. I’m a people-pleasing addict and I have a daily struggle with it. My life is too much about trying to please others and to control things that are out of my power instead of about being real, being who I am and who God created me to be, accepting who I am and what God has placed upon me. I stress myself out far too much about hurting and disappointing people and it’s taking its toll on me. I will stretch myself beyond my limitations just to please someone else with no regard to my own health. I worry. I don’t want them to think I don’t care and that they’re not important to me. But the truth is I’m also worried they might love me less, and I drive myself crazy with it. I further terrorize myself with guilt that I’m not trusting their love enough. “But not yourself…” he replies. But my mind reasons that I should think of others above myself. But I have that all mixed up. I would be thinking more of others if I took care of myself. When I don’t take care of myself, I’m disregarding the feelings of my loved ones who are pained when I get sick. It tears my heart out when any of them suffer, so I should remember how they must feel when I suffer. 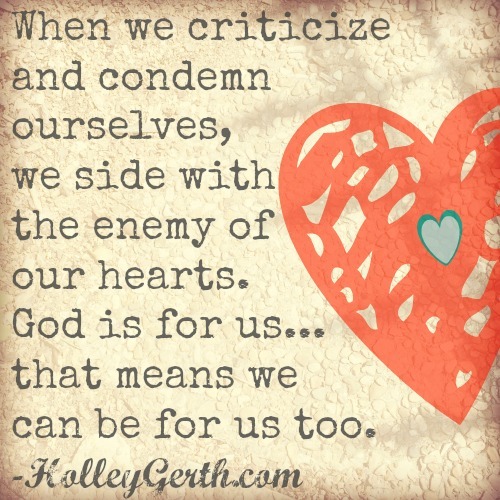 My need to please others results in my becoming a bully of myself, and I know in my heart that God does not want that. But I don’t know how to stop it sometimes. Maybe that’s the problem. I keep trying to stop it instead of admitting I can’t stop it myself. I’m always spinning my wheels and getting nowhere. Sliding back into that addiction again and again. I need help from a Higher Power, but I’m afraid to release my own power. As I lay sick again, God whispered, “Just rest, My child, just rest.” Rest physically for my body but also rest in my spirit. Giving all things into His hands. Relinquishing my power to Him. Free-falling over the cliff into fear and uncertainty, trusting He’ll catch me and carry me on. Do we admit we are powerless in ourselves over _____ addiction? Do we admit our lives are unmanageable? Do we believe a Power greater than ourselves can restore us? Do we make a decision to turn our will and our lives over to the care of God as we understand Him? Will we search our hearts and do a fearless moral inventory of ourselves? Do we admit to God, ourselves, and another human being the exact nature of our wrongs? Do we humbly ask God to remove our shortcomings? Do we make a list of all persons we have harmed and become willing to make amends to them all? Do we continue to take personal inventory and when we are wrong promptly admit it? Do we seek through prayer and meditation to improve our conscious contact with God, as we understand Him, praying only for knowledge of His will for us and the power to carry that out? As we have a spiritual awakening as a result of these steps, do we try to carry this message to other _____ addicts, and to practice these principles in all our affairs? It’s time for us to take care of ourselves as God wants us to. God is for us, but we can be our worst enemy when we’re wrapped up in our addictions. Let’s let go of our own self-sufficiency and fear to trust anyone else and fall into the hands of a God who loves and has our best interests at heart. Who has the power of love and grace in His hands! I read the 12 Steps a few times a month myself just for good spiritual practice. There’s so much value in them. We all have addictions of some sort, and most of us probably relate to yours specifically of wanting to please people. Truth here: “God is for us, but we can be our worst enemy when we’re wrapped up in our addictions.” I want to keep letting go of more and more self-sufficiency and learn how to trust God more! Thanks for this, Trudy. Hi Trudy! Sometimes it sure is hard to see ourselves as the worthy ones. I can relate to your people-pleasing, I was like that too. Well, I’m sure I backslide on it too…I’m not sure I can ever be rid of all of it. Getting sick though, yuck. Maybe your body is saying ‘How about me?’ I think that 12 Step idea is such a great one. I was addicted too, just not to drugs. I was addicted to pleasing others. It’s a long road, but so worth it! And you are worth it Trudy!! You do such wonderful work here on your blog, God truly speaks to you and through you. Take care of yourself so you can keep being a great support to us all. Dear Trudy. Thank you for listening to God and pouring out your heart here. I, for one, am so grateful for your openness and the gift of grace you extend to others. Maybe your husband is right. Perhaps it’s time to be good to yourself? Our nearest and dearest often have an uncanny knack of seeing to the heart of things. As you say, “My need to please others results in my becoming a bully of myself” and it may be that your body is suffering accordingly. A soul ill at ease can mean a body performing likewise.